Your Family in Madrid offers an authentic discovery trip in Madrid, whether you are a professional, tourist or even retired. A homestay for travelers is the best option for you if you want to discover the Spanish and Castilian culture from the inside, the gastronomy and the warm lifestyle of Madrid. It is also, of course, an opportunity to make new friends. The various activities that we offer in addition to your accommodation with a great family will make your stay a complete and colourful experience that will leave you with unforgettable memories. Single or double room (for couples or friends travelling together only). Private bathroom with a supplement. Access to the communal areas. Cooking Classes: Spanish cuisine is world renowned, and we invite you to discover the secrets of the famous “Dieta Mediterránea” with our cooking classes. Dance lessons: Do you want to learn or perfect your Flamenco, Sevillanas, Tango or Salsa moves? We offer courses in the center of Madrid. Spanish Courses: private lessons or small groups, your stay in Madrid is the perfect opportunity to immerse yourself in the language of Cervantes and to deepen your knowledge and language skills. 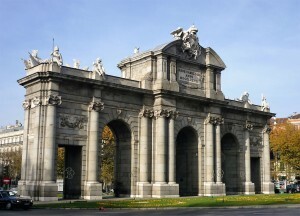 Visits and excursions: we offer and book for you tickets to visit Madrid and its emblematic places on foot, by bike, bus or even Segway, to see a bullfight at the Plaza de lasVentas or a Flamenco show, explore the beautiful towns surrounding the capital, Segovia, Toledo, Avila, El Escorial, Aranjuez all listed among the top World Heritage of Unesco. Dance lessons: group lessons: 15 € hour, 12 € hour from 10 classes. Groups (6-8 students), generally from Monday to Friday. Visits and excursions: consult us. – Contact us specifying the dates of your stay and your date of birth. You can also fill in and send us our questionnaire directly so that we can get to know you better and start looking for families that best match your profile and your preferences. – A deposit will be required for any booking confirmation. The deposit will be returned within a week of departure.